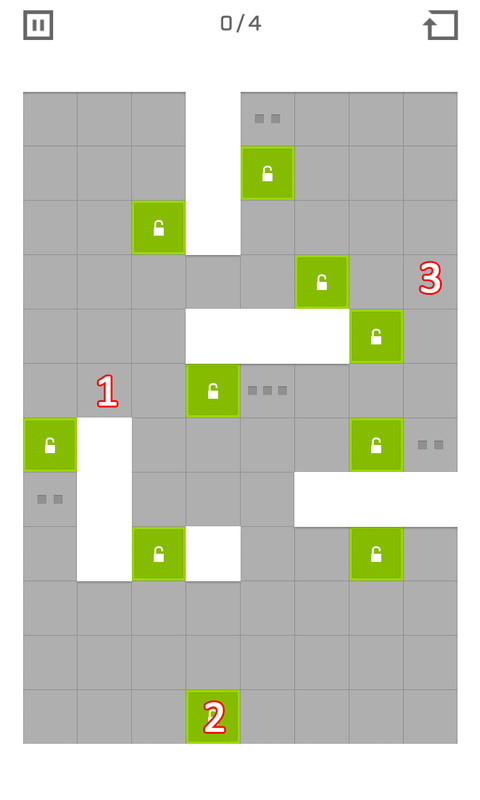 Blip Blup [Pack 9] Level 13, Cheats, Solution for Android, iPhone, iPad, iPod. 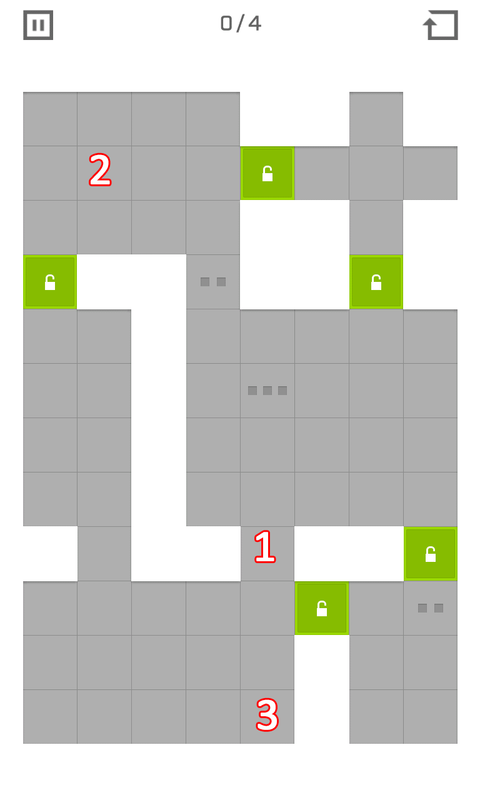 Blip Blup [Pack 9] Level 12, Cheats, Solution for Android, iPhone, iPad, iPod. Blip Blup [Pack 9] Level 11, Cheats, Solution for Android, iPhone, iPad, iPod. Take the piece of paper from the mall table. Now take the lighter that is under the pillows. Look under the couch and take the metal pipe. 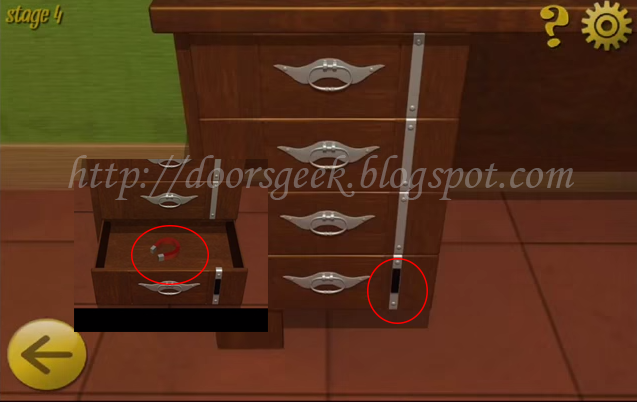 Go at the cabinet on the left and take the pliers that are inside the middle drawer. Use the pliers to open the barrel. Inside you will find a soccer ball that will help you open the other drawers. 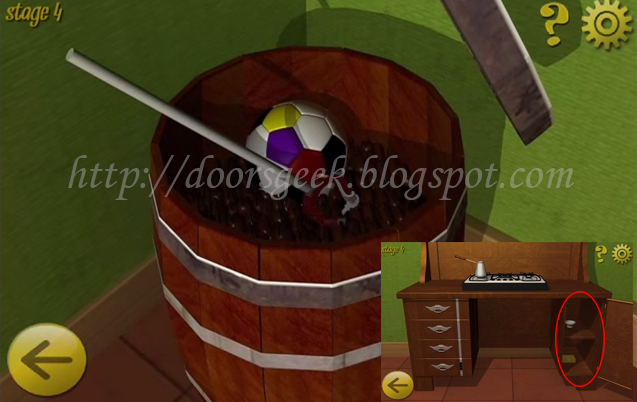 Tap the lock on the bottom drawer and use the colors on the soccer ball to open it (Yellow, Purple, Red). Take the magnet and combine it with the metal bar in your inventory. Use the magnet to get a silver key that is inside the barrel. 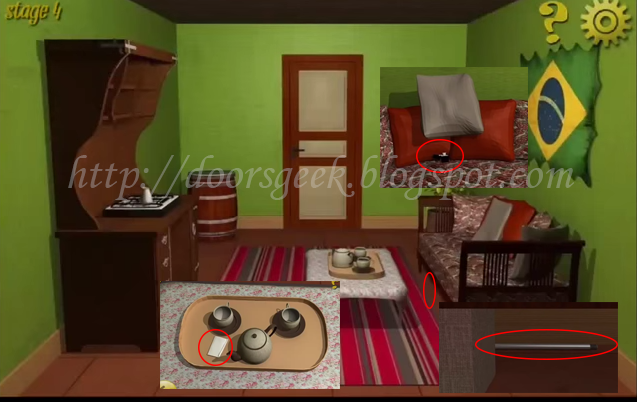 Use the key to open the right door on the desk then pick up the cup that is inside. Take the jar with coffee that is on the top shelf. Go to the stove and light it using the lighter then pour the coffee inside and take a cup o coffee. Empty the cup of coffee inside another cup from the table and you will see the code on the cup's bottom: 1514. 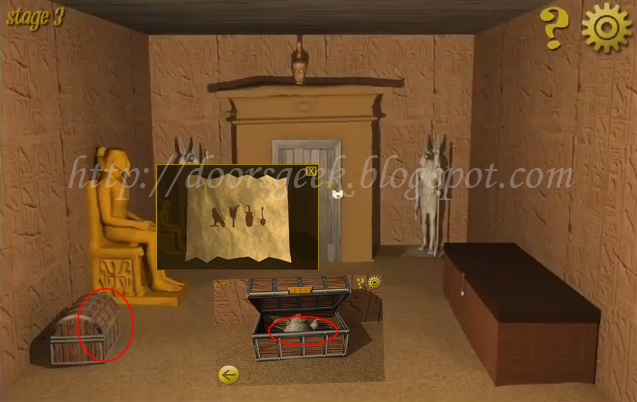 Now go to the right drawer of the cabinet and use the code to open the yellow box. Take the key and use it to open the door. 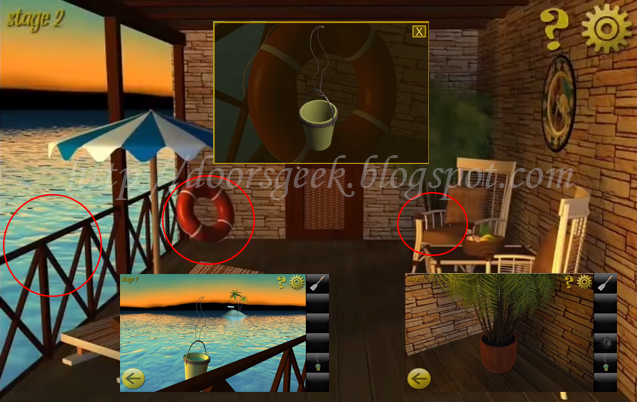 World Escape [Level 4], Cheats, Solution for Android, iPhone, iPad, iPod. 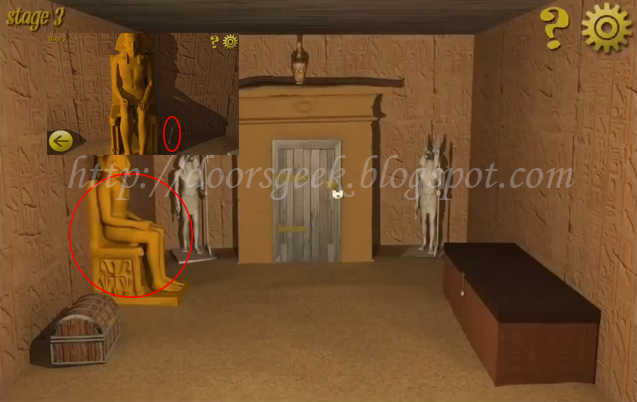 Now tap the white statue on the left, and take the key that he holds. Use the key to open the big wood chest on the right side. Take the stick that is inside. 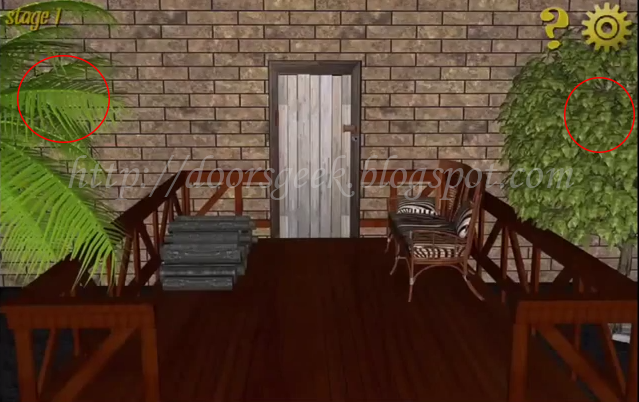 Now tap the vase above the door and use the stick to flip it. Inside you will find a scroll. Now tap the small chest on the left side and use the scroll you found to open it. Take the teacup that you see inside. Now look inside the teacup an you will find the key that opens the door. 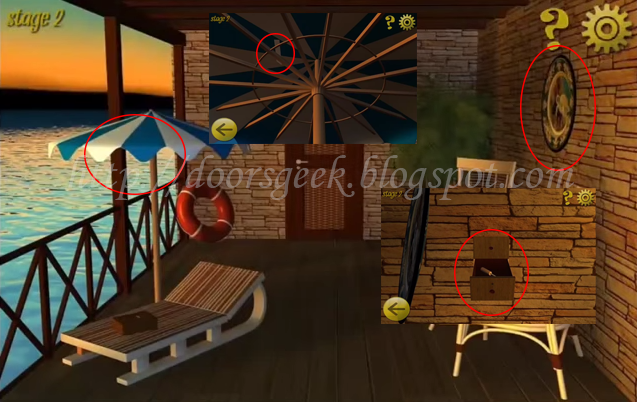 World Escape [Level 3], Cheats, Solution for Android, iPhone, iPad, iPod. 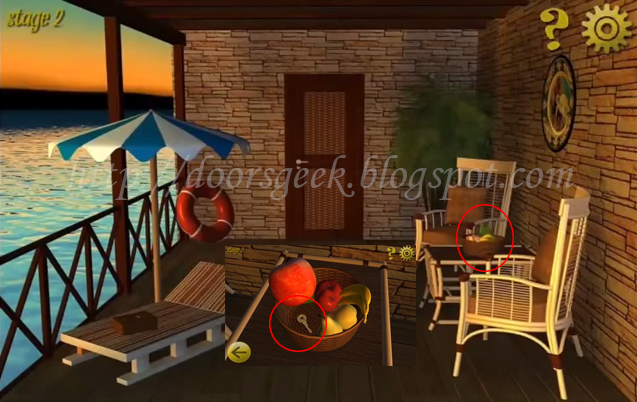 Tap the fruits basket on the table and pick up the key that is under the apple. 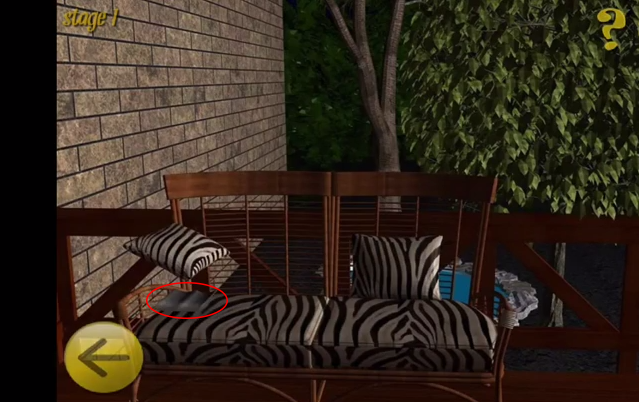 There is also a cutter under the pillow that is on the right chair. 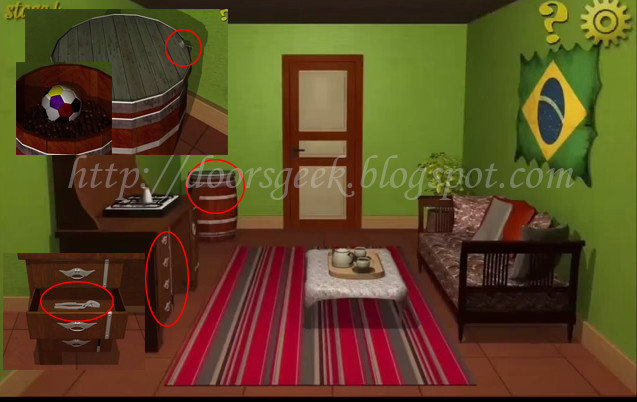 Tap the umbrella an pick up the cutter's blade, then tap the round painting on the wall and use the key to open the bottom drawer, then get the spatula and the bucket. Now tap the red rescue buoy use the cutter to cut the rope on it. Combine the rope with the bucket, then fill the bucket with water from the ocean. Now tap the flower in the right corner and use the spatula to take a piece of paper from the mud. Put the paper in the bucket and you will see the code: "4297". Enter the code on the lock box that is on the sunbed and take the green binoculars. Under the left chair there is a secret compartment that you can open with the spatula. 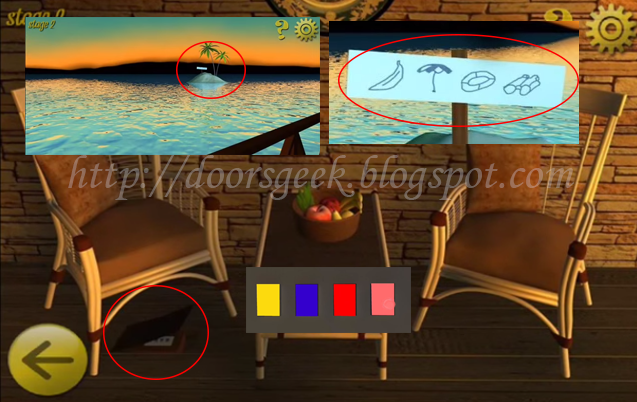 To find the code look with the binoculars on the island to see a sign with a banana (yellow), umbrella (purple) buoy (red) and binoculars (green). So to open the secret box use the colors to open it. Then simply take the key and use it to open the door. 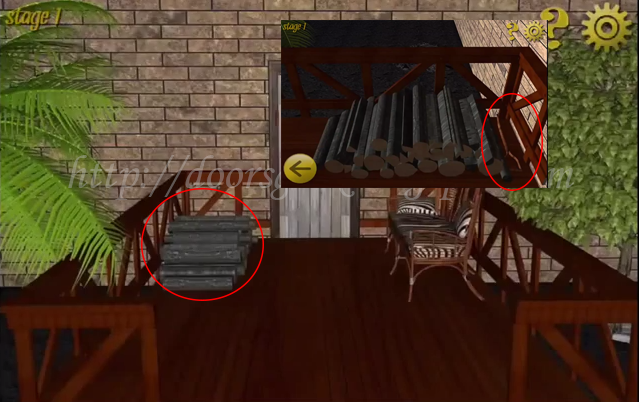 World Escape [Level 2], Cheats, Solution for Android, iPhone, iPad, iPod. 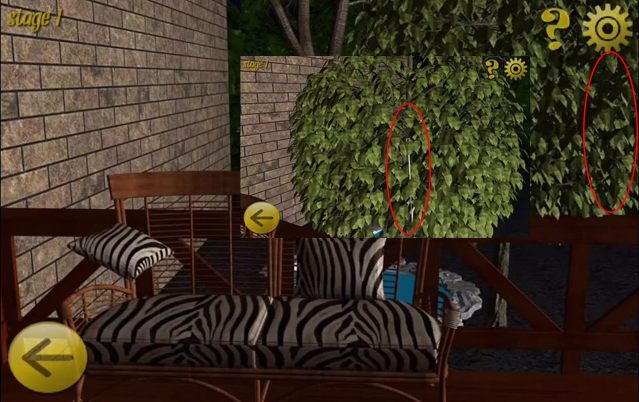 Tap on the left palm tree and pick up a rope, then tap the tree on the right side. Pic up the half metal part of a shovel from under the left pillow on the bench. Tap on the pile of logs and pick up the handle of the shove, that is in the right side. Tap the right side of the tree behind the bench and the take the metal arrow that is in the tree, then combine the arrow with the rope. 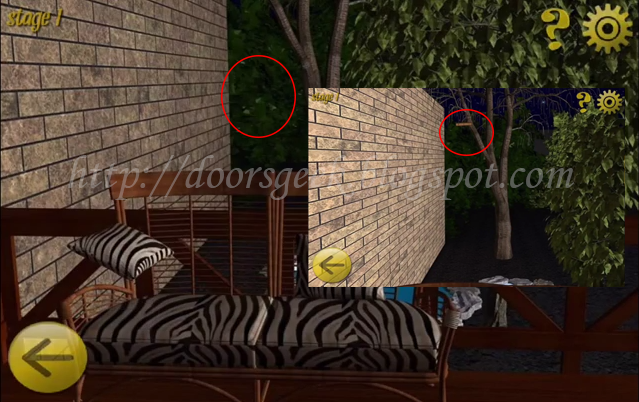 Tap the area behind the bench, and use the arrow to get the rolled paper that is in the tree. Now tap the dirt area behind the logs and use the shovel to dig a locked box. 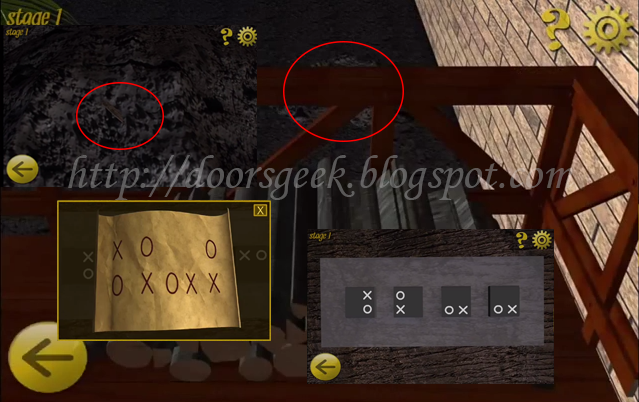 To open the box make the patterns as they are shown on the piece of paper you found. Now simply take the key and use it to open the door. 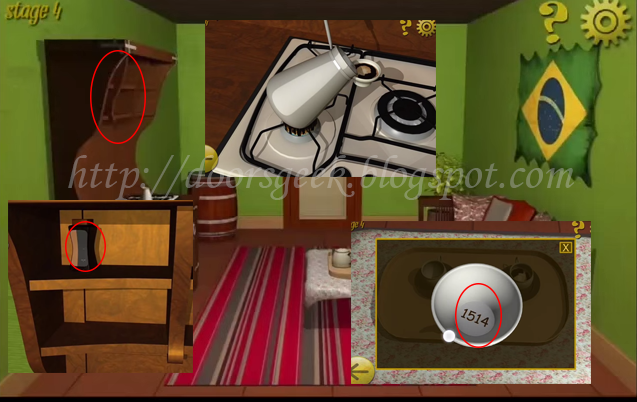 World Escape [Level 1], Cheats, Solution for Android, iPhone, iPad, iPod.